It's been a few months of working to master a program called ZBrush...literally the most difficult program I've ever worked with. It's a program primarily used for the creation of amazing creatures for the movie industry, but flexible enough it's being used by jewelry artists. I've been fascinated by CAD since my senior project at the University of Texas in the early 1990s, where I made a ten-second video of a prickly pear cactus losing a fruit that bounced off a table and onto the floor. It was primitive, but took months of work. And at this point, I have no idea how models make their way out of ZBrush and into an actual movie, but the modeling is just downright amazing. My goal is to be able to design jewelry and send it out eventually to a casting house while sitting in a beach cabaña on an island somewhere, but for the time being I'll be 3D printing the models and casting them myself. I am optimistic! 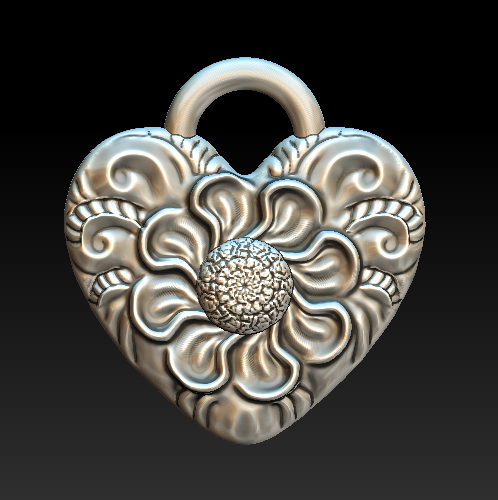 I am also in the process of creating instructional videos in ZBrush for jewelry artists, and hope to be teaching others in the near future. Testing a technique for large post earrings...design is not great...needs more of a consistent thickness. But filigree idea is interesting. I think my grandma would like this one! I created a tutorial video for this one on YouTube…how to make a hollow bead! This hideous little flower failed on the printer—it was too big, the band too small, and the supports were wrong! UPDATE: the surface design on this one did not stand out enough when printed, and was a nightmare to put supports on. I leave it here as an example of how far I’ve come.